Note: This is a preliminary analysis. Sample sizes and estimates are likely to change. A more detailed final report is being prepared for publication in a peer-reviewed journal at a later date. The Bee Informed Partnership, in collaboration with the Apiary Inspectors of America (AIA), conducted the eleventh annual national survey of honey bee colony losses. For the 2016-2017 winter season, 4,963 beekeepers in the United States provided validated survey responses. Collectively, these beekeepers managed 363,987 colonies in October 2016, representing about 13% of the country’s estimated 2.78 million managed honey producing colonies1. An estimated 21.1% of colonies managed in the United States were lost over the 2016-2017 winter. This represents an improvement of 5.8 percentage points compared to the previous 2015-2016 winter, and is below the 10-year average total winter loss rate of 28.4% (Figure 1). Beekeepers not only lose colonies in winter (October – March) but also throughout summer (April – September). The 2016 summer colony loss rate was 18.1%. When all the survey results were combined, beekeepers lost 33.2% of their colonies between April 2016 and March 2017. This is the second lowest rate of annual colony loss recorded over the last seven years. 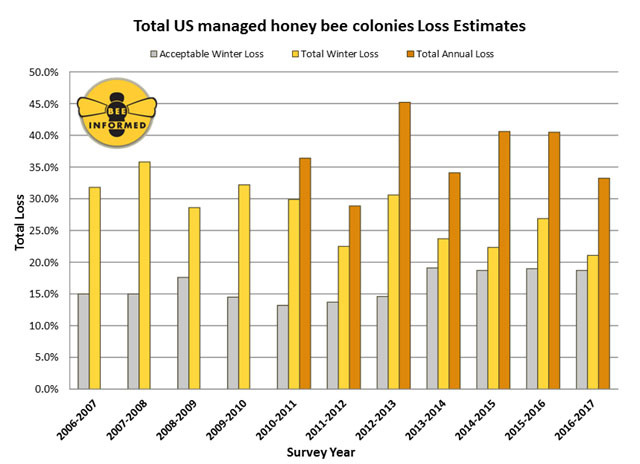 Figure 1: Summary of total overwintering colony losses in the United States across eleven years of conducting the winter loss survey (yellow bars; October 1 – April 1) and across six years of conducting the summer (April 1 – October 1) and annual loss survey. Total annual loss values (orange bars) include total winter and total summer losses. The acceptable winter loss rate (grey bars) is the average percentage of acceptable yearly colony losses declared by the survey participants in each year of the survey. This survey was conducted by the Bee Informed Partnership, Inc. 1. Based on 2016 NASS Honey Report figures (published 2017). 2. Previous survey results found total winter colony loss values of 27% in the winter of 2015/2016, 22% in 2014/15, 24% in 2013/2014, 30% in 2012/2013, 22% in 2011/2012, 30% in 2010/2011, 32% in 2009/2010, 29% in 2008/2009, 36% in 2007/2008, and 32% in 2006/2007 (see reference list). Kulhanek, K; Steinhauer, N; Rennich, K; Caron, DM; Sagili, RR; Pettis, JS; Ellis, JD; Wilson, ME; Wilkes, JT; Tarpy, DR; Rose, R; Lee, K; Rangel, J; vanEngelsdorp, D (in review) A national survey of managed honey bee 2015-2016 annual colony losses in the USA. Journal of Apicultural Research. Seitz, N; Traynor, KS; Steinhauer, N; Rennich, K; Wilson, ME; Ellis, JD; Rose, R; Tarpy, DR; Sagili, RR; Caron, DM; Delaplane, KS; Rangel, J; Lee, K; Baylis, K; Wilkes, JT; Skinner, JA; Pettis, JS; vanEngelsdorp, D (2016) A national survey of managed honey bee 2014-2015 annual colony losses in the USA.Journal of Apicultural Research 54: 292-304.
vanEngelsdorp, D; Underwood, R; Caron, D; Hayes, J (2007) An estimate of managed colony losses in the winter of 2006-2007: A report commissioned by the apiary inspectors of America. American Bee Journal, 147(7): 599–603.